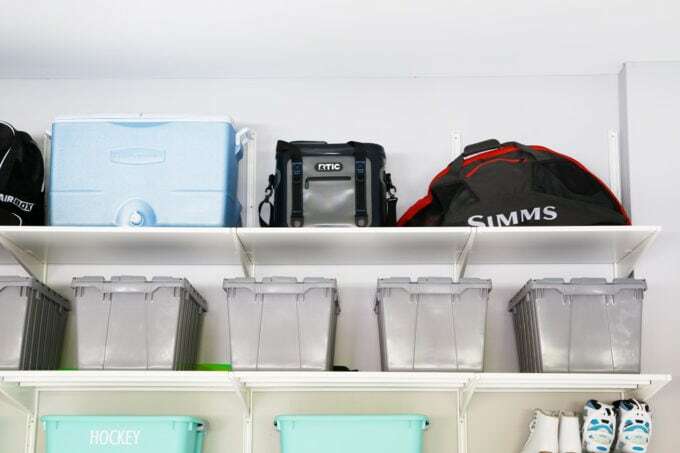 We’re spilling the top 10 best tool storage systems for organizing your workshop so that your DIY projects can be done as efficiently as possible! 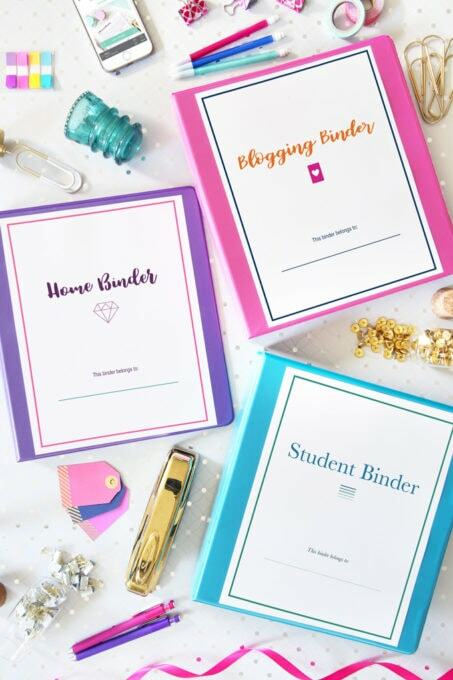 We have been diving into our basement organization project headfirst this month, and I am so excited about our progress! 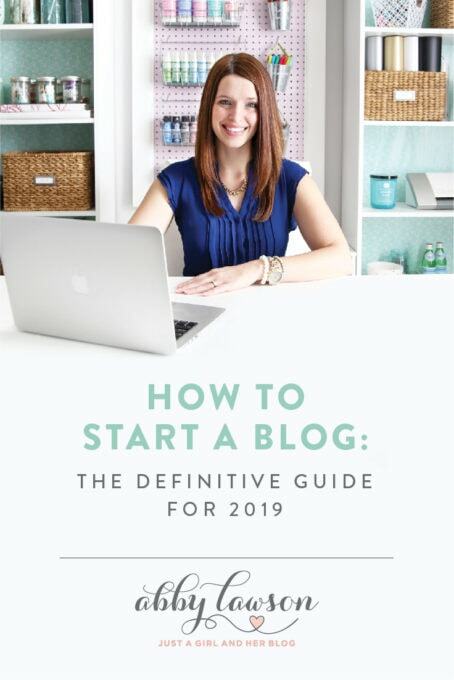 I have been sharing sneak peeks over on Instagram, and every time the camera swings over to Donnie’s tool shelf, I become inundated with DMs saying, “We need some sort of system to organize our tools! What are you guys using? !” so I promised that I would try to get Donnie to write up a post about all of his favorite tool organization systems, and boy did he ever comply! I like tool storage and organization systems almost as much as the tools themselves. There are few things more frustrating than needing a specific tool and not being able to find it. 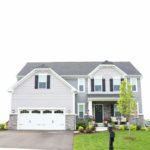 House projects take long enough as is, so it’s beyond frustrating to spend half the time trying to find what you need. 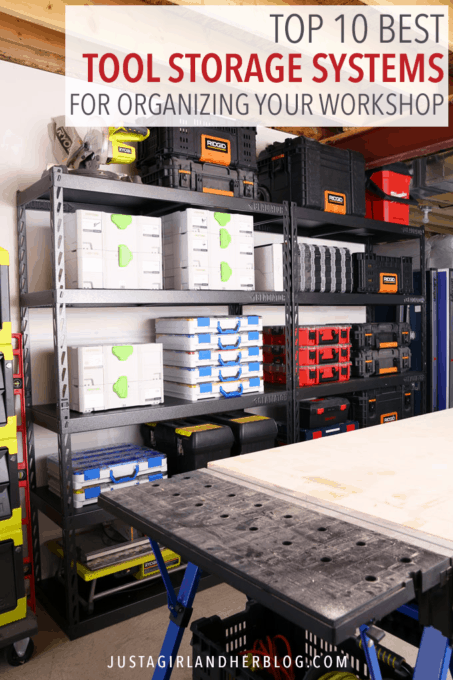 Over the years I’ve invested in several different tool storage organization systems and toolbox systems that have helped me be more productive with our house projects. 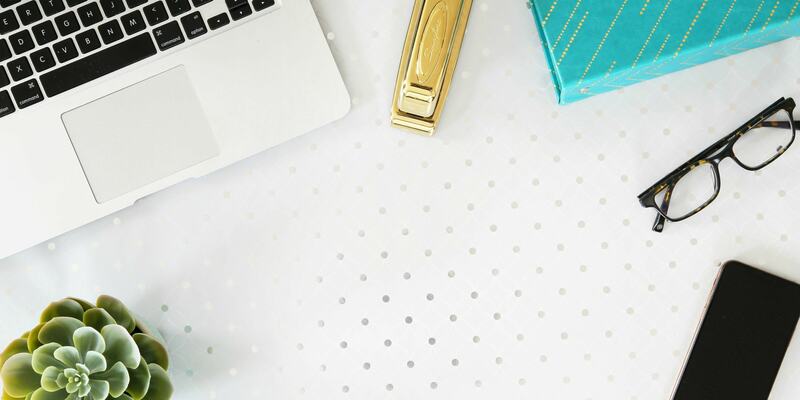 In this post I’ll talk about the tool organization systems I’ve used and the systems I haven’t used but are worth consideration. For the garage mechanic or stationary-working type of person, it makes sense to purchase a large tool chest with cabinet doors and drawers. 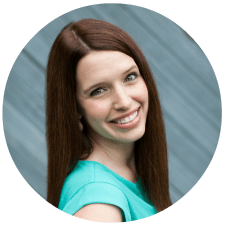 This person will primarily work from the same location, so it’s easy to open a drawer from a large rolling tool chest, grab the hand tool they need, and get to work. My projects are all over the house. One day I may be upstairs installing window trim. The next day I may be fixing a plumbing issue in the boys’ bathroom. And the next day I may be installing shelves in the garage. 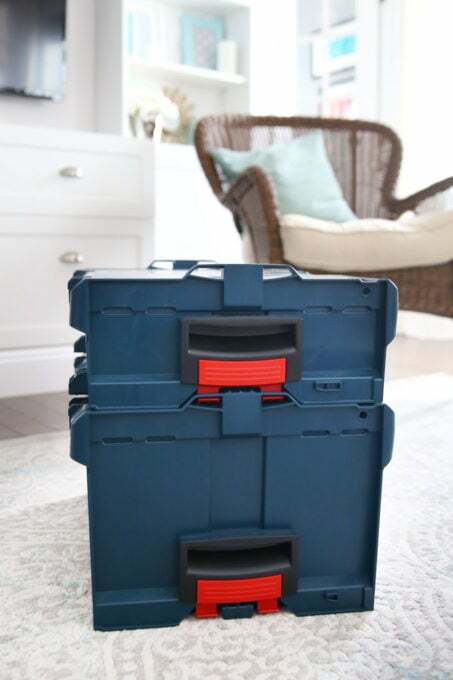 I favor portable and modular tool boxes and containers over the big and heavy stationary tool chests. I need to be able to quickly move my tools throughout the entire house. For the professional transporting his (or her!) tools to and from a worksite, the level of durability they need is way beyond the level of durability that I need. Moving storage containers in and out of a truck or work van to the job site each day is tough on tool boxes. My tools rarely leave the house. I may take them up and down a few flights of stairs, but they are never sliding around in the back of a truck or out in the elements of a construction site. 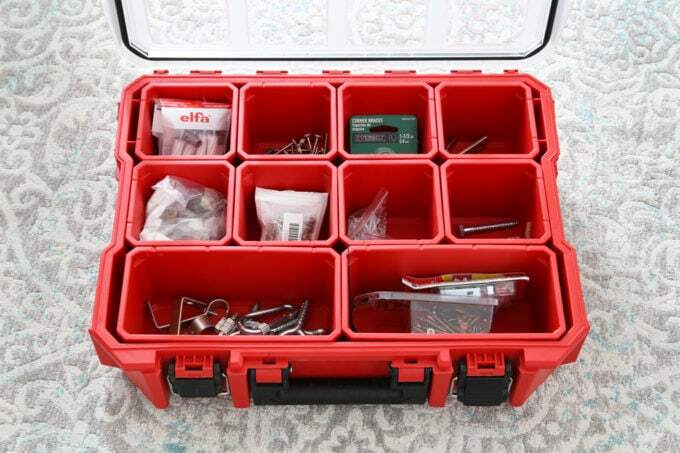 Generally, the extremely durable tool organization systems are also heavy. A toolbox that you can drop a cinder block onto without cracking or denting is going to weigh a lot more than a brittle plastic container. But it’s a balance. 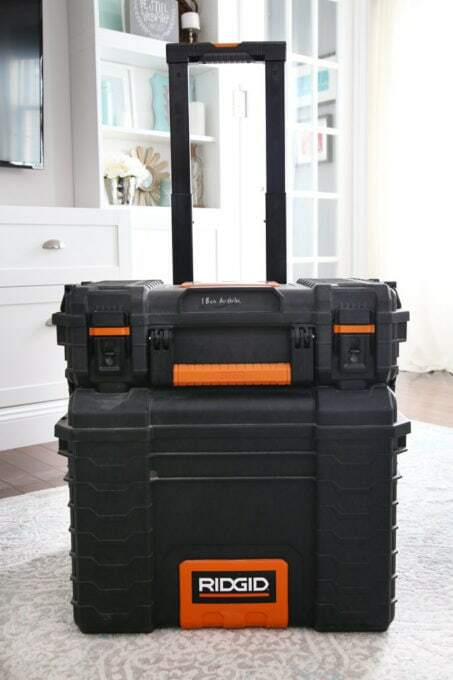 It’s no fun to carry toolboxes around that are heavy and bulky even before you add any tools. Max durability is not always the best thing for everyone. The price range for toolbox systems is wide. If you have lots of tools and opt for the most expensive options, it will feel like you’re spending a small fortune on your system. Generally speaking, the more expensive systems are much nicer, so if you only have a small tool collection to organize and store, the sticker shock may not be as bad. 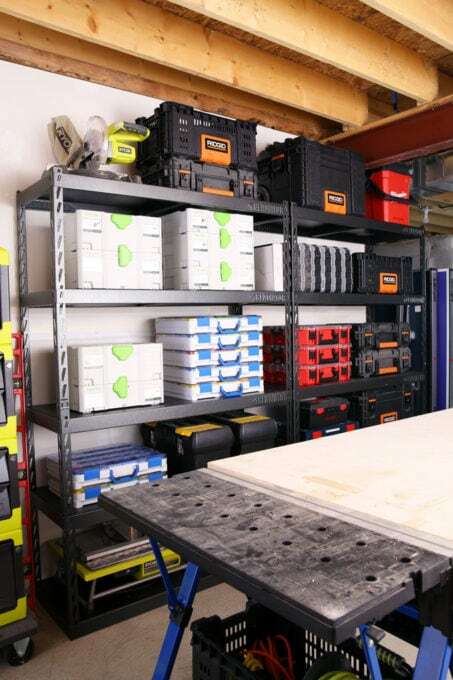 Conversely, if you have a garage or basement full of tools to organize, the most expensive systems may not make sense. There are advantages to picking and using one single tool storage system. 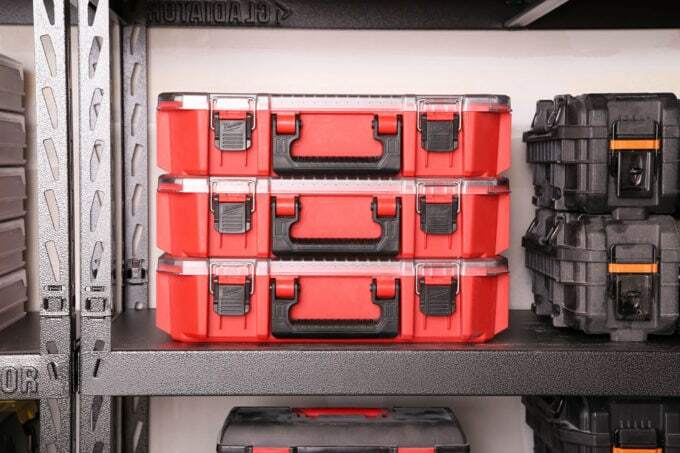 Most of the tool boxes and organizers will stack and latch neatly together, plus it just looks impressive on shelves if it’s full of one single type of tool storage container. If you are starting from scratch, this may be possible. 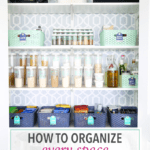 But for most of us, buying and organizing tools happens over many years, and it just may not be possible to have one storage system. This is the situation I’m in. I don’t feel like there’s a need to obsess over having all matching toolboxes and organizers. Also, keep in mind that there is nothing wrong with going slowly. 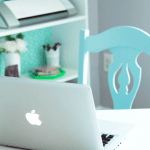 After reading this post, I recommend picking the storage solution that you think makes the most sense for your situation and then purchasing just a few pieces. Spend some time with those pieces and make sure it truly is a good fit before you go all in with a particular system. I have been using Bosch L-Boxxes for many years now. When Abby and I started making videos for our organizing YouTube channel, I needed to find a solution for organizing and storing camera equipment and accessories. I needed something lightweight but durable, and something that stacked nicely and looked good on the shelves in my office. Available in multiple sizes. 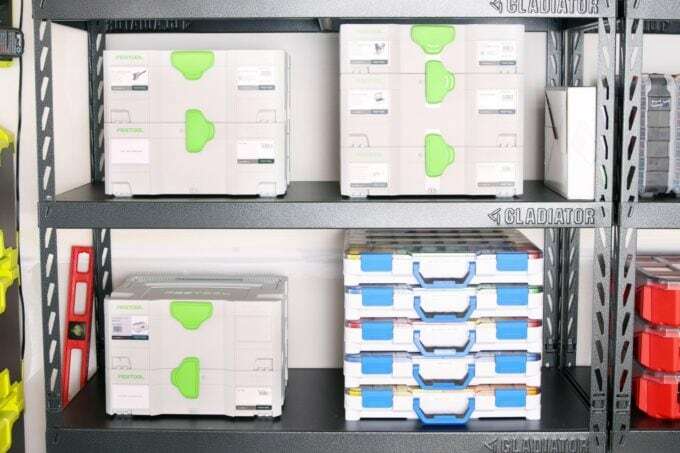 I currently have L-Boxx 1s, L-Boxx 1As (same as 1s but with included divider cups), L-Boxx 2s, and L-Boxx 3s. They also have a very tall L-Boxx 4, but I haven’t had a need for something of that size. Top handle. Having small parts in some of my L-Boxxes, it’s absolutely essential to have a large and robust handle on the top of the toolbox. In my experience, side handles (where the box is on the side when carried, similar to a briefcase) end up un-organizing everything in the box when carried, and things sliding and banging in the tool box can break delicate tools and gear. High quality plastic. Yes, the boxes are plastic. 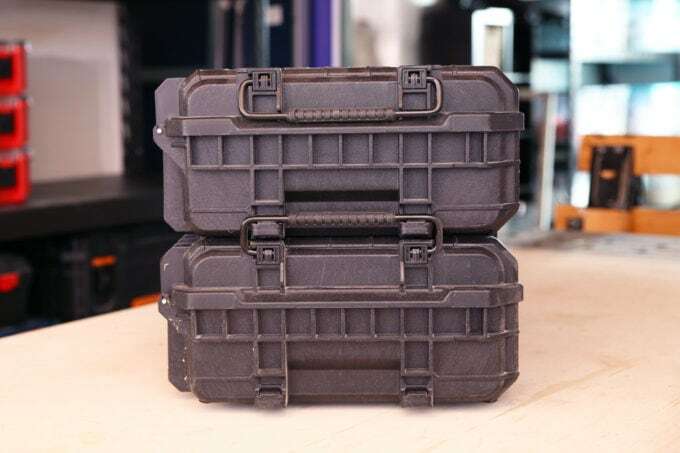 That may be a concern for professional contractors taking the toolboxes to job sites, but for a homeowner, the plastic is plenty durable. 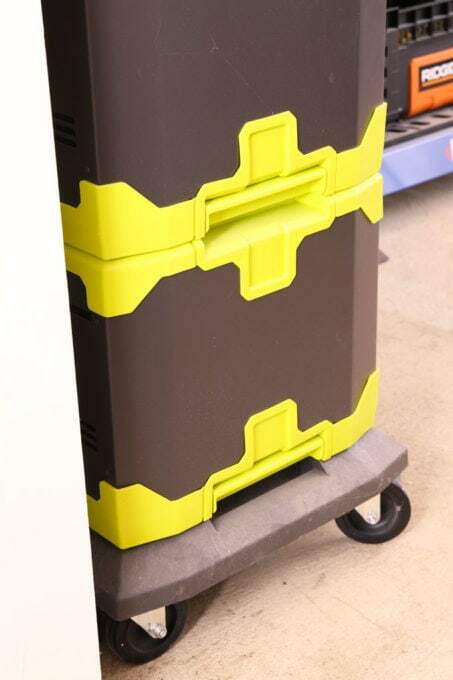 The Milwaukee Packout system and DeWalt Tough System are certainly more durable, but with that durability comes a lot of extra weight that can be a big deal when carrying the toolboxes around. Perfect size. For my particular needs, the L-Boxx size and footprint dimensions are absolutely perfect. They fit nicely on shelves and hold a lot of tools and gear, but they are still easy to carry with the extremely important top handle. 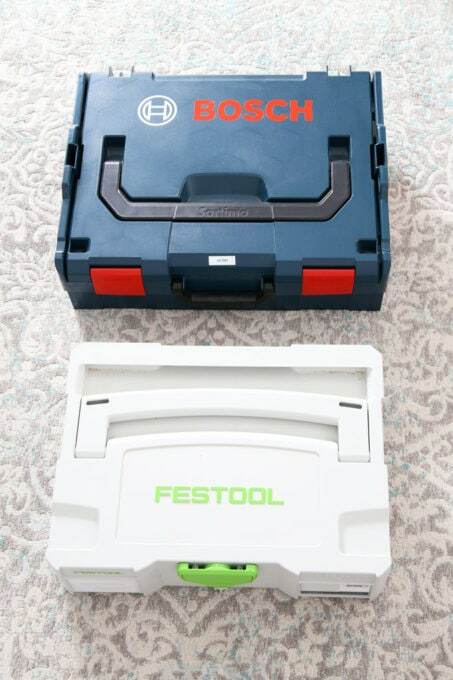 I like some features of other systems better, like Festool for example, but I much prefer the Bosch L-Boxx size. Overall, Bosch L-Boxxes are my favorite tool storage system. They aren’t inexpensive, but they will last a long time and the system isn’t going to disappear and become unavailable. They were first introduced in Europe and because of their success eventually made their way to North America. In the past year they’ve made some design tweaks to the toolboxes, but they still made sure everything was backwards compatible and still worked together as a system. 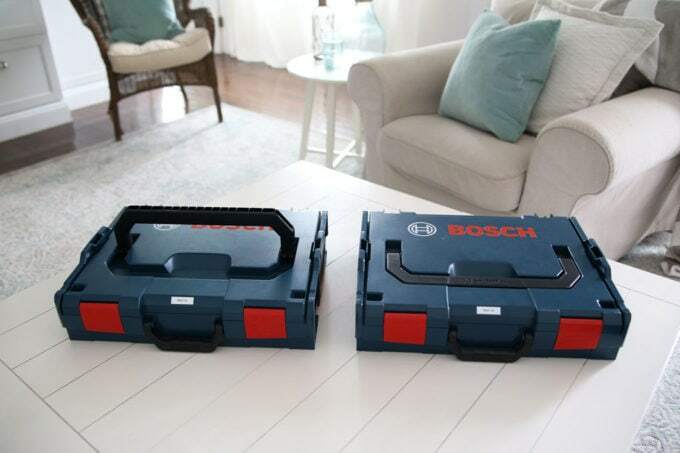 For the homeowner or hobbyist that needs mobile tool storage, Bosch L-Boxxes are a great way to go. In fact, this is a system that I currently have plans to add more containers to. 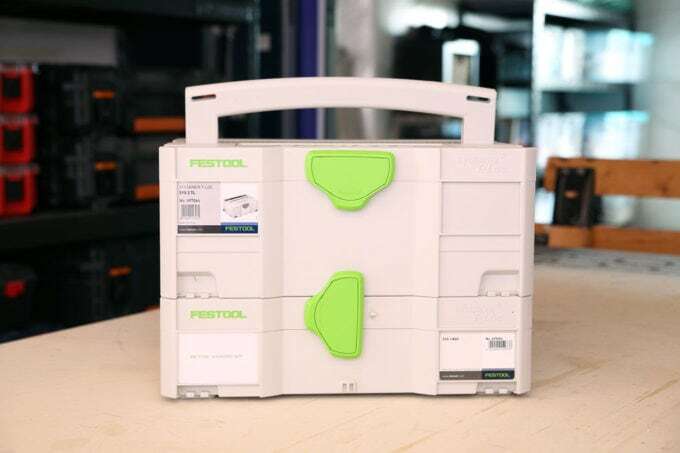 Currently, my main everyday toolbox and picture hanging kit are in Festool Systainers. I’d like to switch them to Bosch L-Boxx 1s for a little more storage. If you haven’t heard of Festool, they make high-end woodworking power tools. 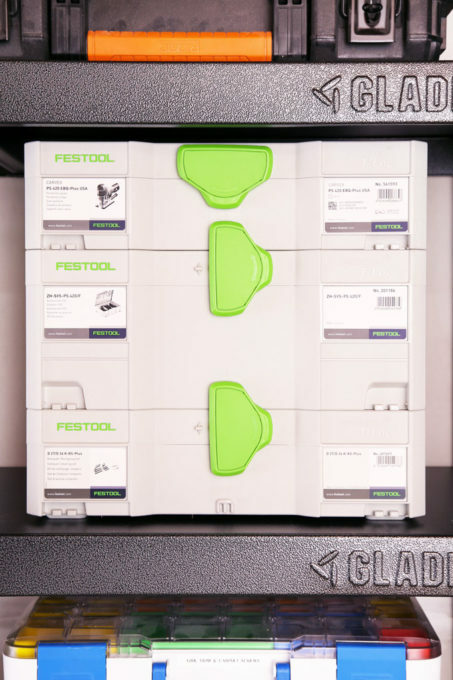 Overall, the Festool brand is very expensive, and that applies to their Systainer tool storage system as well. Festool Systainers are a “system” in the truest sense of the word. 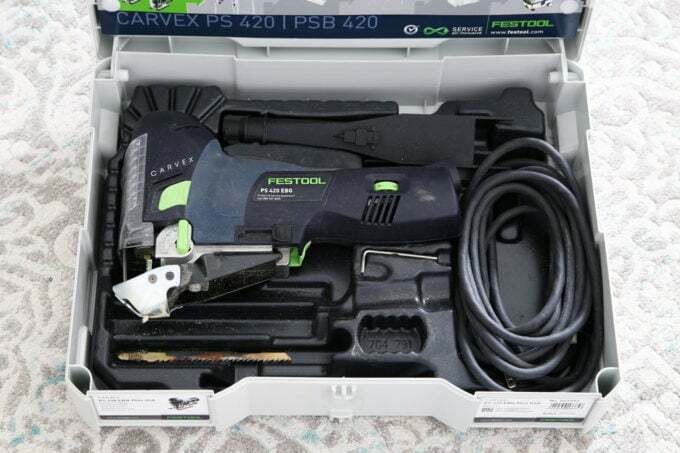 Festool power tools come nicely packed in the Systainers, and then you can also buy empty Systainers, and everything fits together and locks together nicely. Crazy expensive. And I really mean crazy here. For example, my main tool box that has a few of the essential hand tools I need for everyday house projects is in a Sys 2 box. Amazon has it listed right now for $80. I find that price ridiculous. I have a few Systainers that came with tools, and I have a few that I found either on sale online or bought at a local Woodcraft shop that was discounted because of a scuff. I don’t believe I’ve never paid full price, and I don’t believe I ever will. Great design. The way the toolboxes stack and fit together is great. The Festool T-Loc system is the best locking system I’ve seen. It’s quick, and there is a visual indicator to know if the boxes are locked together, closed, or open. It really is genius. High quality plastic. 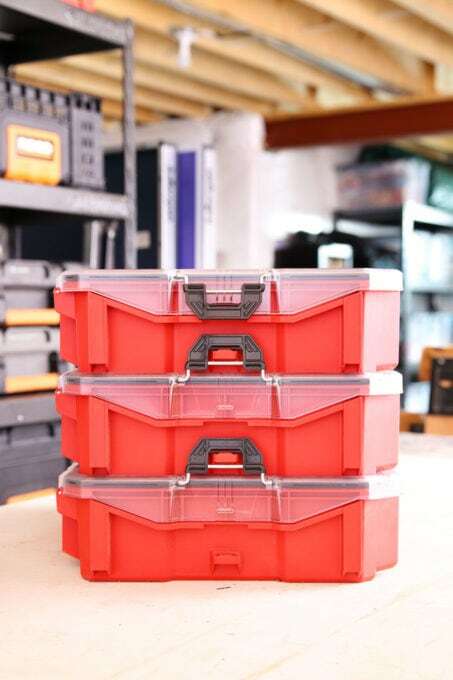 These tool boxes are built with high quality plastic with tight tolerances. They open and close more smoothly than any other system I’ve used. 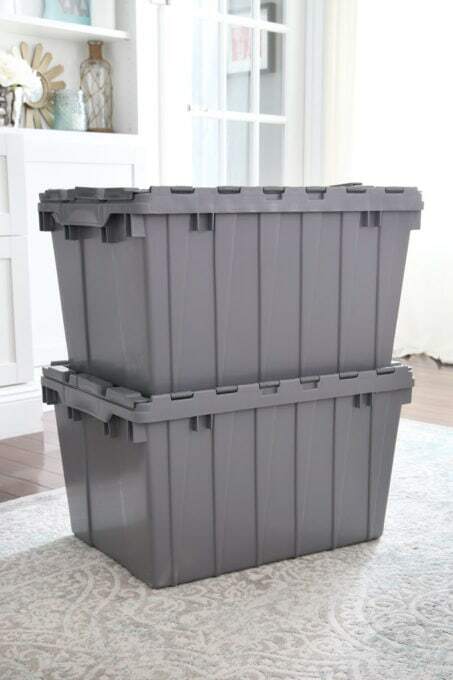 I’ve had no durability issues, but again, if you are a professional taking boxes to a job site, there are more durable and certainly more economical options. Lightweight. The Systainers are great to carry around the house. 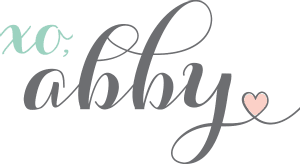 On a typical work day, I may grab my main toolbox and lock it with my picture hanging kit and carry both together up to the top floor in our house to hang some blinds for Abby. They work perfectly for this scenario, whereas the Milwaukee system or DeWalt system would just feel too big and heavy. Top handle. The top handle is large and sturdy. I’m only able to use a Systainer for my picture hanging kit because of the top handle. The tool box will never be on its side where everything inside would get disorganized. Not the best size. The Systainers are small. The footprint is tiny, even when compared with the Bosch L-Boxxes. The small size is nice for carrying them around the house, but I just can’t fit much into each box. This forces me to get even more containers at exorbitant prices. I prefer the L-Boxx sizing for most needs. The Festool Systainers are a well-designed product but not worth the price for most people. If you are a professional woodworker doing lots of client work, packing and unpacking your tools, the convenience may be worth it, or if you are already heavily invested in Festool power tools, the Systainers may make sense for you. For most people, though, I think there are options that make more sense. 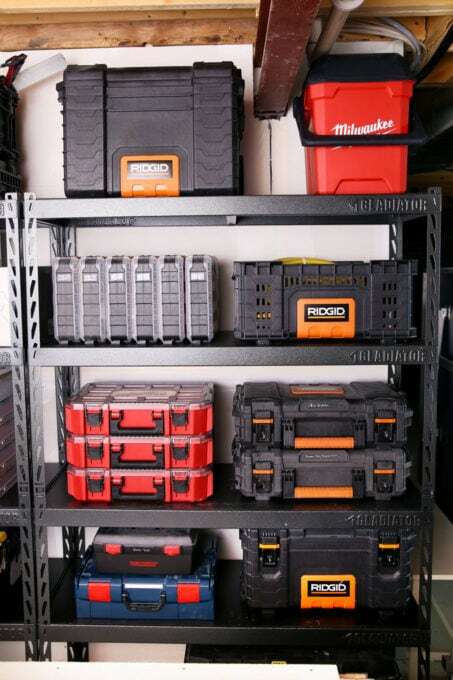 The Ridgid Pro Toolboxes were the first official tool storage “system” I bought into. They were released in 2014. 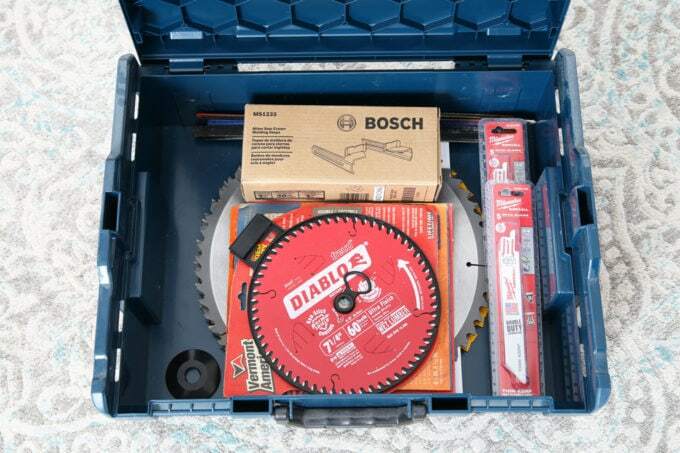 At that time we were in the townhouse and my tools were either in super cheap and flimsy toolboxes or spread out on a piece of plywood sitting on saw horses– not an ideal setup for working efficiently. The Ridgid system has had good staying power, and they’ve consistently added new pieces over the years. I think they are a tremendous value and maybe the best option for many people. Still, there are a few negatives that have prevented me from going all out with their system. Great price. Compared to other systems, the Ridgid Pro series seems like a bargain. The largest wheeled toolbox is usually around $60 and prices go down from there to the $20 storage crate. Compared with some of the other systems, you get a lot of storage volume for your money. Extremely durable. I’m not particularly hard on my toolboxes, but the Ridgid Pro series seems almost indestructible. They are way more durable than I could ever need. The plastic is thick, and the boxes even have a rubber gasket to keep the elements out. Heavy. This is a negative for me. The medium size tool box feels heavy even before adding any tools. Fill it to the top with hand tools, and it will be difficult to carry by hand. The Ridgid Pro series boxes are significantly heavier than the Bosch L-Boxxes. For some people, the weight isn’t an issue and they may favor the super durability over the heavy weight. Quality dolly system. The largest box acts as the base of the system. It has sturdy wheels and a telescoping handle. The other boxes stack on top and latch. This would be an ideal situation for worksite use, unloading the boxes out of a truck and then wheeling them to where they are needed. For me, the dolly aspect is never used. My tools are stored in the basement, but most of my work happens upstairs in the house somewhere. The dolly doesn’t help that scenario. Easy stacking and latching. The feet on the boxes stack nicely on top of each other, even without latching, but the side handles swing up and lock into the toolbox above. It’s a good system that is quick to use. The “Pro Organizer” doesn’t have a top handle. To me, this is the biggest negative in the entire series. 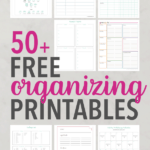 The Pro Organizer is the perfect size for most of my needs. 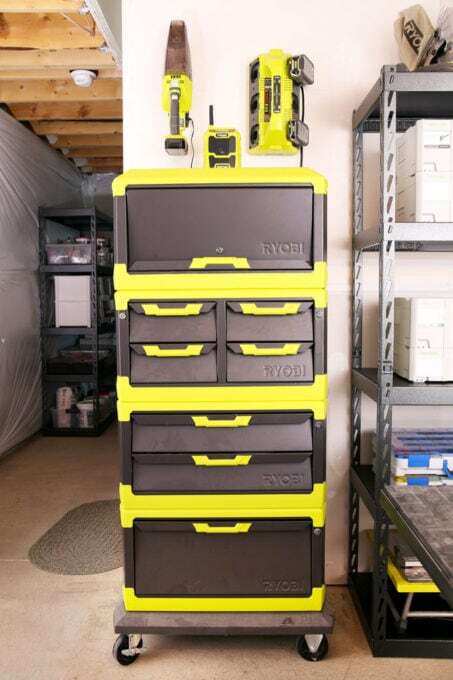 In fact, I use one to store my Ryobi Airstrike and all of its accessories. It has a nice divider and removable storage cups. But the huge issue is that there is no handle on the top of the box like you find on Bosch L-Boxxes. 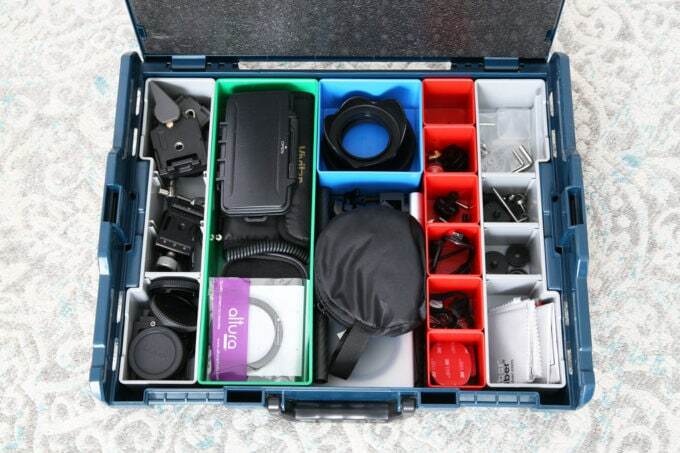 When I carry the Pro Organizer using the side handle, all of the contents slide around and can get unorganized. 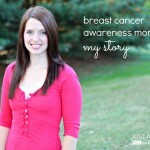 This is the single biggest issue that has prevented me from investing more into this system. Additionally, when two Pro Organizers are latched together, because there is no top handle, you have to grab one side handle which puts everything off balance and makes it awkward to carry. The bottom line is that this system is meant to be wheeled around. If wheeling your tools around on the dolly isn’t ideal for you, this probably isn’t the best system. 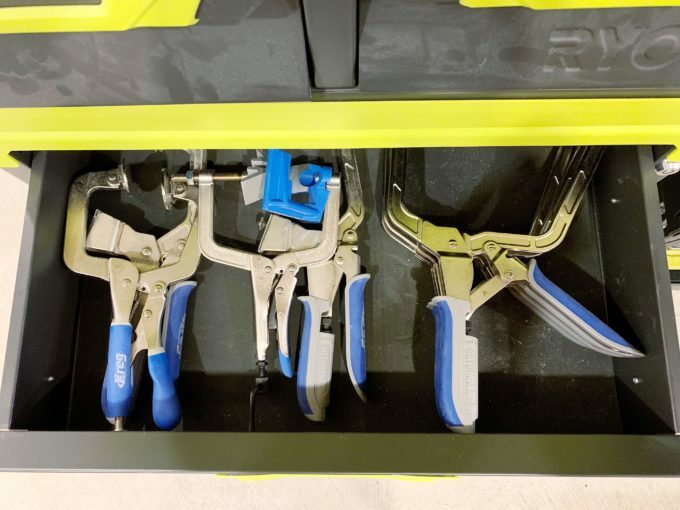 This is unfortunate because I originally planned to have a dedicated electrical and dedicated plumbing tool box in the Pro Organizers because they are the perfect size with the perfect amount of interior organization. The lack of top handle convinced me otherwise. Excellent “open top” storage crate. 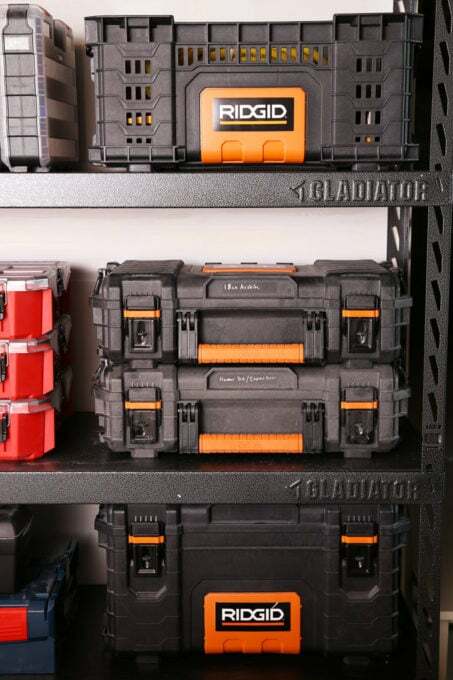 The Ridgid Pro Crate is my favorite piece in the entire line. 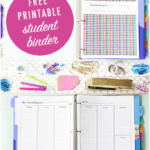 They are cheap, crazy durable, fairly lightweight, and stack beautifully. I use them to store some bulky items like air compressor hoses and clamps. I plan to add more of the crates to my collection. The Small Parts Organizer rounds out the collection. 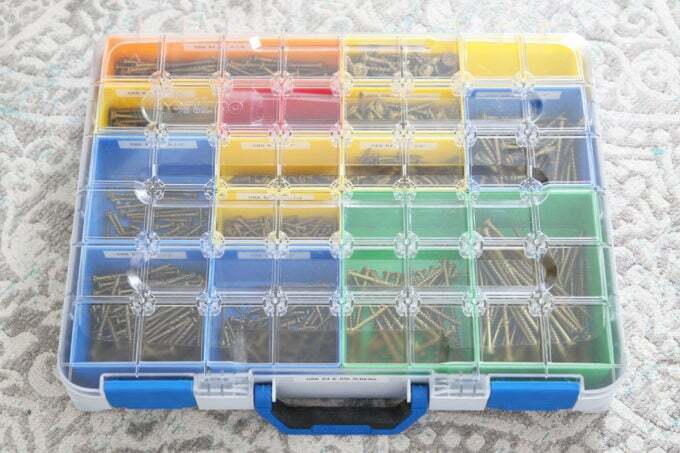 I haven’t used this piece because it’s fairly new, but the Small Parts Organizer fills a major gap in the system. It stacks and latches just like all the other pieces, but it has a clear top and ten removable storage bins, some with dividers. This was a needed piece in the system. Easy to find in stock at Home Depot. It’s nice to be able to walk into a Home Depot and actually put your hands on the tool boxes. That’s something I can’t do with the L-Boxxes or the Festool Systainers. And when I need to add another piece, I can just run out to Home Depot and grab one. 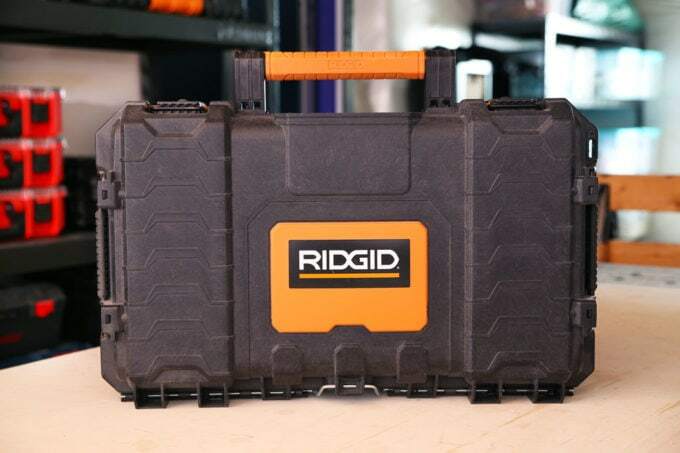 The Ridgid Pro Toolboxes are a great option for many people. It’s a great balance of price, size, and durability. If you have lots of tools to store but still want a nice system, this will be the most economical option. For some, the top handle issue I harp about is no big deal. If that’s you, this could be a great system. For my needs, the durability is overkill and the dolly system, while extremely well built, doesn’t help with the setup of my house. I am a huge fan of the crates, and those will be part of my system on into the future. I wanted to mention this Ryobi system because I use it and love it, but unfortunately, they are usually not available in North America. My wonderful wife Abby found them at a Direct Tools Outlet and bought them for me as a birthday gift. And what a gift it was! I haven’t seen them at this tool outlet since. 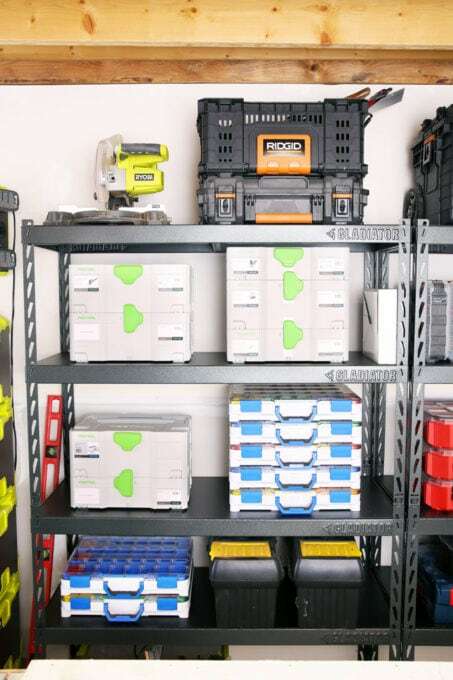 The Toolblox cabinet is my only stationary storage system. In the system, I store tools and accessories that stay in the basement, such as certain clamps that I use with my work bench and woodworking tools that I use with my miter saw. It’s also where I store a dust mask and my tool vest. The idea behind the system is all of these stacking and modular units. They snap together and then all rest on a high quality dolly that rolls around easily. I think the entire system with all of the cabinets, drawers, and base was around $300. For high quality storage like this, I think it was a great value. If you live in Australia, the Toolblox system may be easy to find. If you’re in North America, you may be out of luck unless you happen to stumble into one like we did at the tool outlet. I don’t use these totes for tools, but I’ve seen others use them in that way. They are the storage totes that I use in our garage to store camping, fishing, and backpacking gear. I’m mentioning them here because I’ve been impressed with their durability. They also stack well, and they’re a reasonable value for the money. 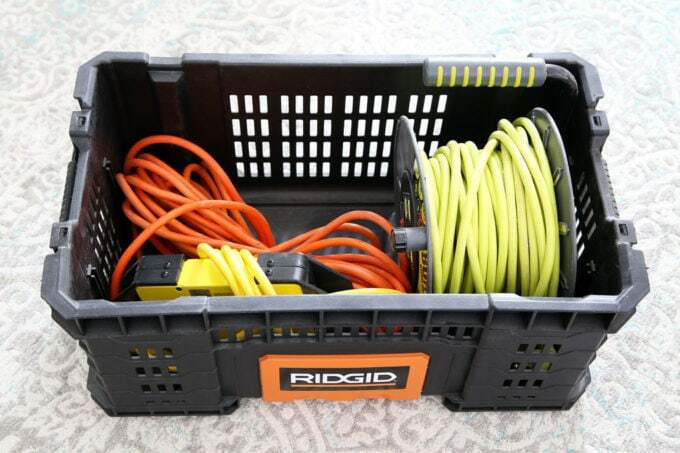 If you need to store bigger, less-frequently-accessed tools, these totes may be a good option for you. 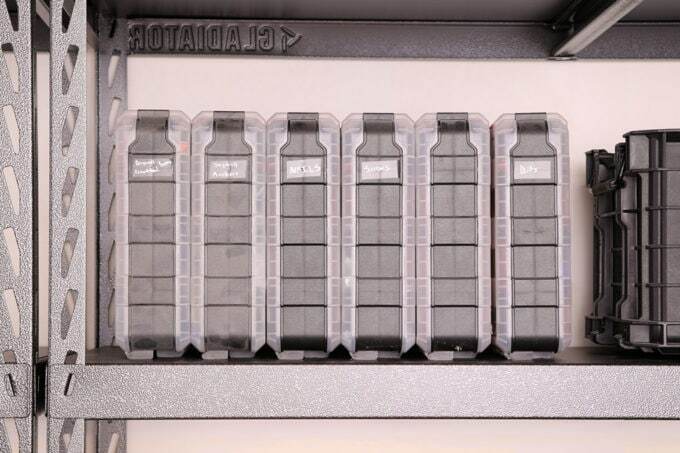 They certainly aren’t mobile without a good handle or latching lid, but for pure storage volume, these are great. 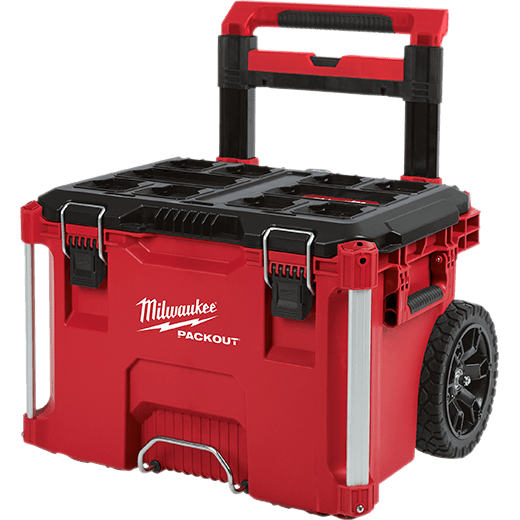 This is a relatively new system that Milwaukee introduced in 2017, and it may just be the best modular tool box system available. Unfortunately I’ve never used this system. For that matter, I’ve never even seen them in person. They are available online, but I haven’t seen any pieces of this system at our local Home Depot. This system must be pretty popular because in a few short years, it’s already been built out to include a rolling toolbox, a large tool box, small tool box, and numerous small parts organizers. It’s a complete collection already. For my needs, the most appealing storage container in this line is the large tool box. The small tool box doesn’t have a top handle, and you know that’s a big issue for me. 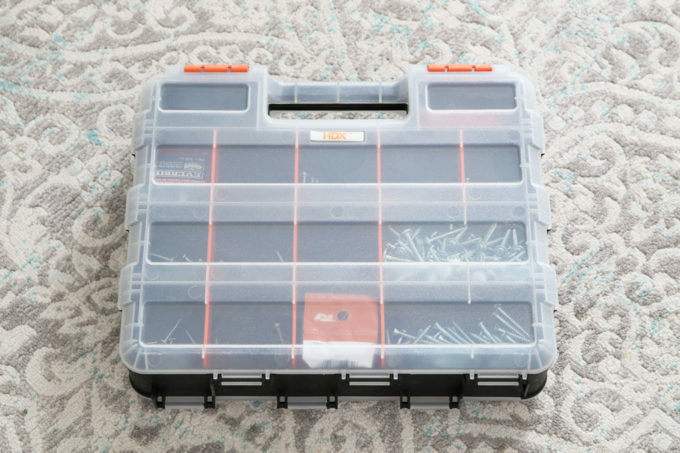 Pairing the large toolbox with one of the Packout small parts organizers could be a great solution for an everyday toolbox / organizer that you can easily carry around the house. While this system seems nice, it’s also about twice the cost of the Ridgid Pro Toolbox line. For some, the superior design and functionality of the Milwaukee tool boxes may be worth it. For others it won’t be worth it. 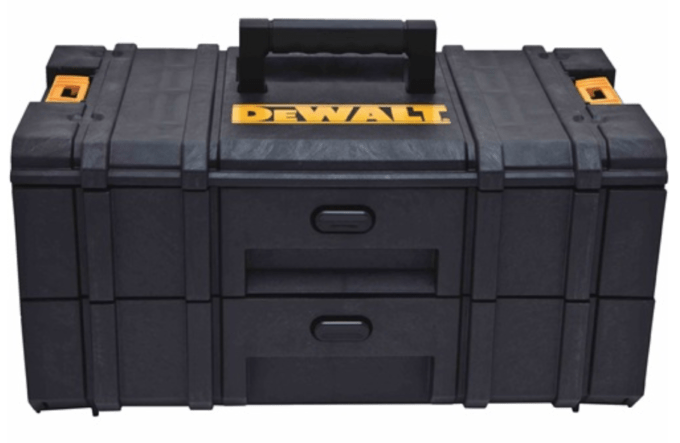 The DeWalt Tough System could be a good middle ground between the Ridgid Pro Toolbox System and the Milwaukee Packout system for someone looking for ultra-durable contractor-grade wheeled storage. The price falls in between the two competitors, but it is still closer in price to the Ridgid boxes. To me, the best thing about the DeWalt Tough System is the small case. 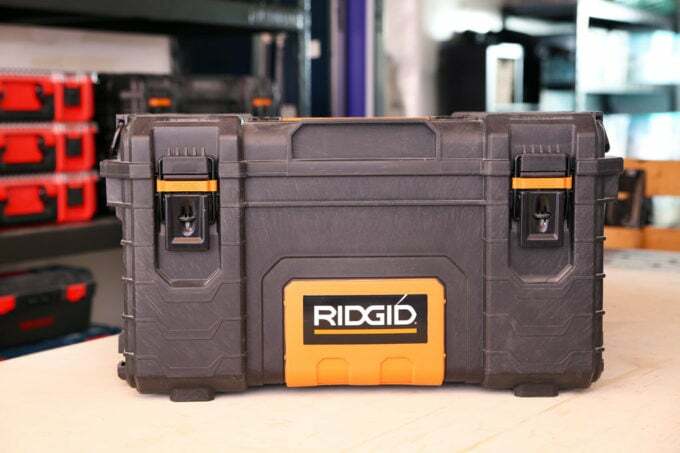 It has lots of nice internal storage and, unlike the Ridgid Pro small toolbox, it has a top handle! That means that you can carry the toolbox around without everything shifting and rolling around on the inside. The only problem is that it is about twice the cost. The DeWalt Tough System also has a workshop racking system to hold the boxes for about a hundred dollars. But to me, you can spend $100 and get a very durable shelving unit like the Gladiator one I use for my tools. 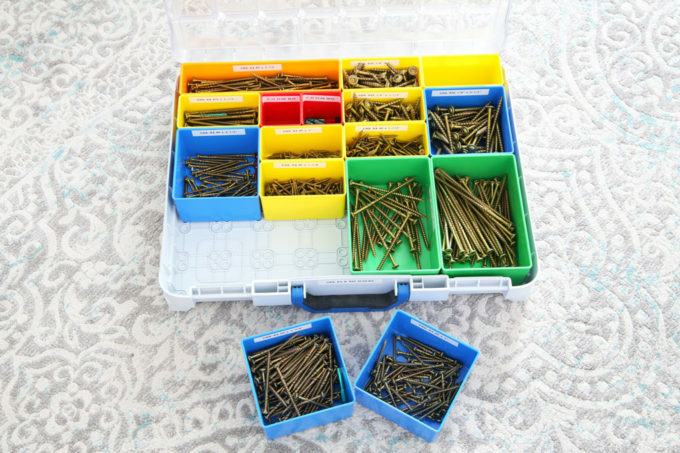 A post on tool storage options wouldn’t be complete without mentioning small parts storage. I’m talking about screws, washers, and all manner of other hardware. 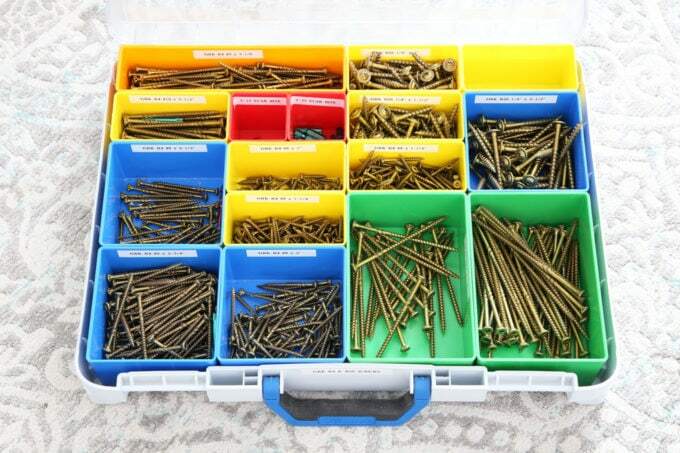 It’s important to have a system for storing all of these small parts. For instance, it’s nice to be able to quickly find a #8 3/4″ machine screw, without digging through piles and bags of hardware. 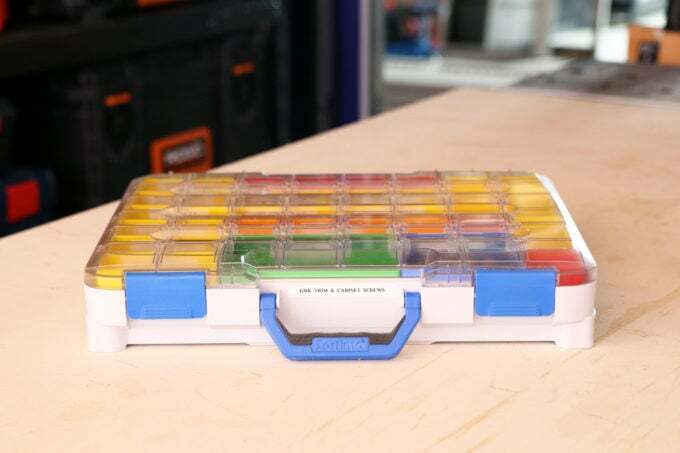 In my opinion, the Sortimo T-Boxx small parts organizers are the absolute best storage solution for workshop hardware. My initial inspiration for using Sortimo products came from Adam Savage of Myth Busters fame. A few years ago I found a good deal on Amazon UK for the storage containers and bought a handful. I then proceeded to label each removable container and fill out the boxes with hardware. This was one of the best things I have done for woodworking and workshop productivity. Yes, it was a pricey to do this. But I’ll never have to buy another system. These will last me forever. What makes these boxes so great is the size. The footprint is large, but the boxes are shallow. With the clear lid, it’s so easy to see everything in the container, and the removable cups make it easy to arrange my hardware in a way that makes sense; I can just grab the little cup of the particular hardware I need. They stack nicely together, and I can store so much because of how many little cups are in each container. The latches are also very durable, and I haven’t had any issue with small parts drifting from one box to another, even when holding the containers upside down and shaking. When I purchased mine years ago, they were only available in Europe, except for people with Sortimo corporate accounts. I think things have changed a bit in recent years, and they are easier to find in the States, but the prices have also gone up some. Even with current prices, I think it’s worth it. 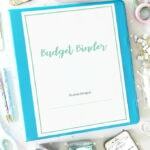 It’s a one time expense that you will never have to make again. I’m glad I spent the time setting these up. 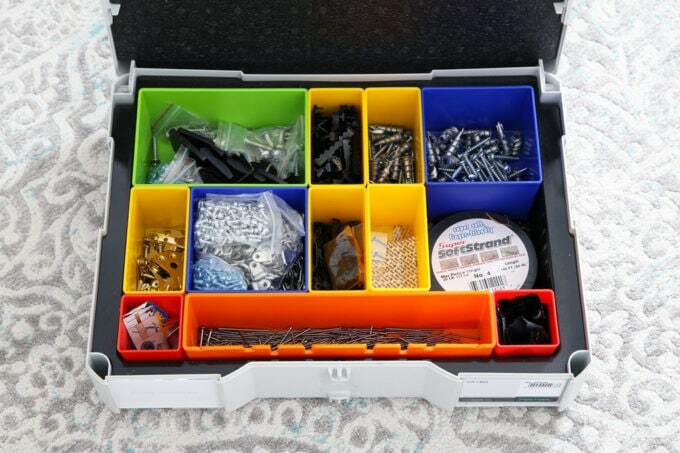 These cheap HDX organizers were my first foray into finally tackling my mess of screws, nails, nuts, bolts, and washers. These little containers are surprisingly good for the price. The downside is that they are small, and the clear plastic lids are somewhat milky, making it hard to see what is in each container. Still, for ten dollars, I don’t think anyone will be disappointed with these containers. 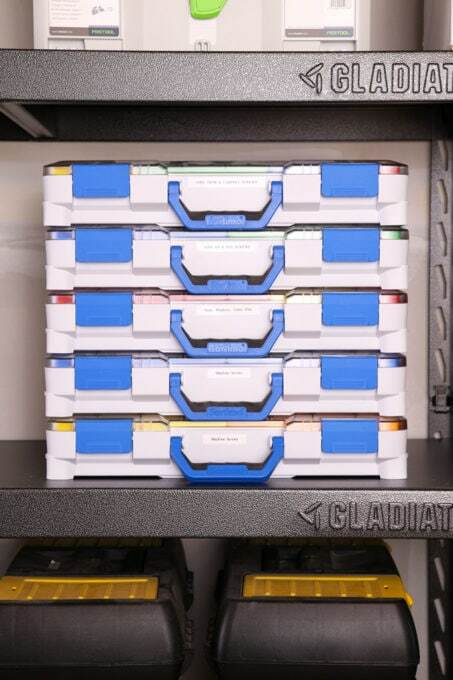 It could be a good solution for organizing hardware if you don’t want spend the money on the much larger and nicer Sortimo organizers. I use and love these containers for things that don’t make sense for the small compartments of my Sortimo system. 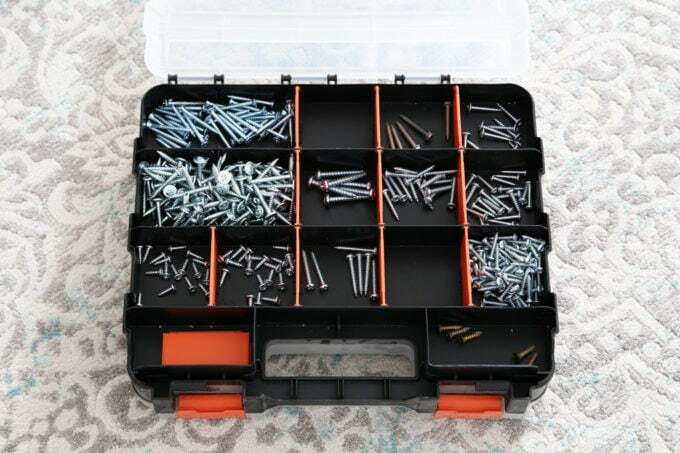 The removable cups in the Milwaukee organizer are much larger than the HDX organizer and Sortimo organizer, so to me, it doesn’t make sense for traditional hardware like screws and nails, but it’s great for slightly larger items. In mine, I store random items like hinges, eye hooks, and other mounting hardware. These are things that don’t make sense to store in a traditional toolbox, but are too big for my Sortimo. The Milwaukee organizers can also latch together using latches on the side of the container, which is a nice feature. For about $20, these are a great value, but be aware that they predate the Milwaukee Packout System and are not compatible. Whew! 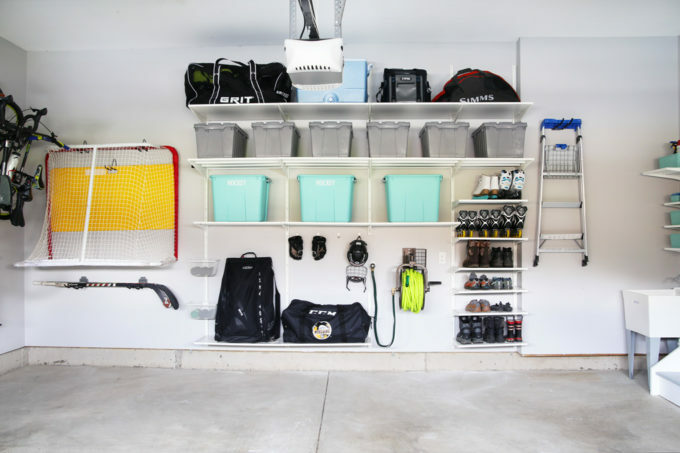 I know that was a ton of info, but I hope it gave you some good ideas for tool storage systems that would work best for your home and family! 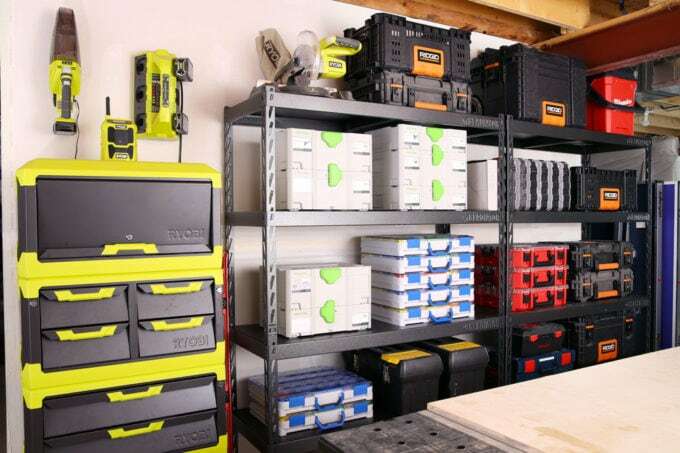 We also know that this isn’t a completely exhaustive list, so if you have another tool storage system that you use and love, be sure to tell us about it in the comments so that we can check it out too! Great review on all these storage systems! Particularly the point in whether one would need durability but comes at a cost in weight and size. For example, I own the Bosch l’boxx series. Only system I know cause I own Bosch tools to match the fit inside. Great system but I heard and read good things about the Milwaukee Packout system. So decided to give it a try. I got the starter system ( not cheap- $299 CDN). When I brought it home I quickly realized it wasn’t for me. 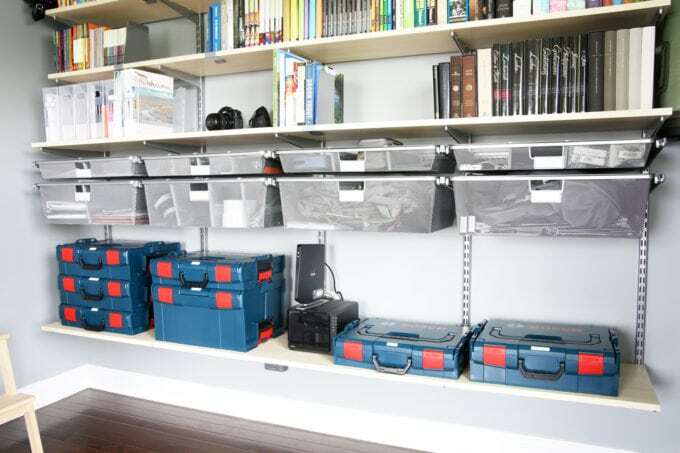 I’m a home diy’er and my l’boxx system is stored on shelves that are organized and ready for my home projects. The Milwaukee is a behemoth. Footprint is way larger then the l’boxx and made for on the go contractors. It can take a beating and withstand the elements. Load it up with tools and you got some serious weight to haul around. A beautiful system but not for everyone. I don’t think there’s an all perfect system but your write up certainly is well informed for who’s interested. Good job! Thanks so much, Peter. I’m glad you found it helpful!